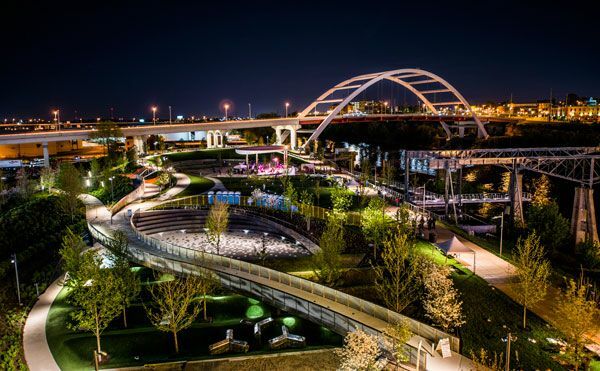 Cumberland Park, by Hargreaves Associates, in Nashville, Tennessee, USA. 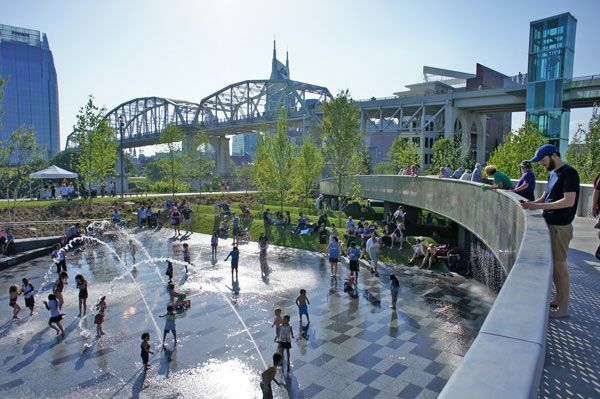 With more than 3 million visitors a year, the city of Nashville realized it was losing an opportunity in regard to the Cumberland Riverfront. 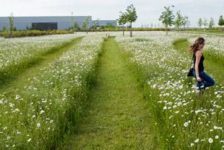 With the help of Hargreaves Associates, the government, many specialists, and a considerable private and public investment, the project went from paper to rock. Water has always been the source of life, whether it is the ocean, a river or a lake. All great cities in history have been founded around or along a body of water: the River Thames in London, the Seine in Paris, New York Harbor and the Hudson river in New York City, Lake Michigan in Chicago, and the world-famous Nile River in Egypt. 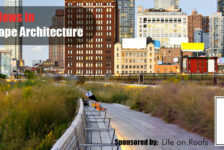 This natural treasure is mainly used as a food resource and communication bank, but sometimes a very clever individual or a group comes up with the great idea of using this magnificent element as an urban strength for social and economic development. The master plan is divided into four phases, the first of which is now completed, and we are going to take you there. 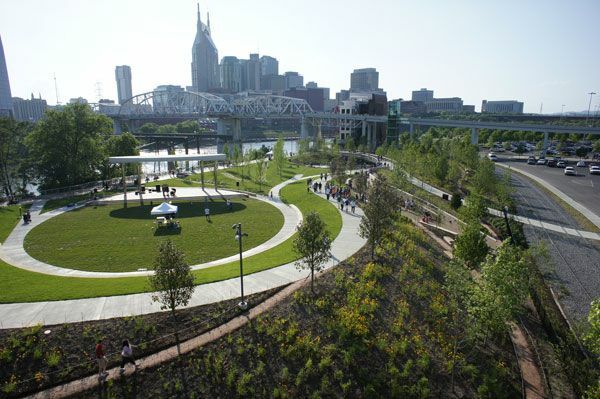 The second-largest city in Tennessee waited too long, but, as a result of collaboration among the Metro Nashville Parks and Recreation Department, the U.S. Army Corps of Engineers, and the citizens, the Nashville Riverfront Concept Plan was conceived. The project consisted of a four-phase regeneration program, with each phase longer and bigger than the last. 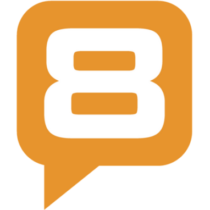 The Kick Starter: Phase I Phase I was estimated to last five years and was conceived as a major improvement of the Riverfront Park. 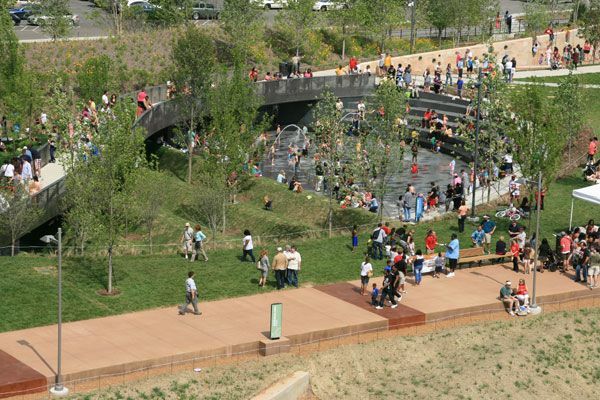 Water features, climbing walls, river overlooks, trails, and picnic lawns are among other elements that have turned this park into a new city landmark. Phase II With the success of Phase I, the next step will be to design a new inland recreational waterway, with the LP Field (home of the Tennessee Titans NFL franchise) as the major attraction. 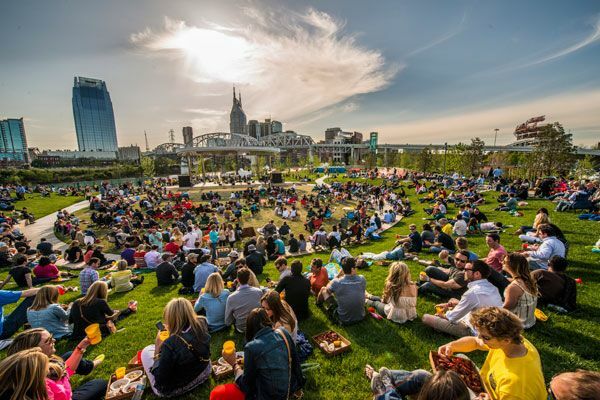 Phase II will offer a world of fun opportunities, starting with the LP Field, an indoor entertainment center, waterfront restaurants, sports fields, an outdoor music pavilion, a festival lawn, river walks, bridges, and a boulevard with multimodal transit options. Phase III For Phase III, we have Cayce Landing — an industrial-like area that will be transformed into an integral small business option for entrepreneurs and a simple residential neighborhood. The purpose of this intervention is to unlock the riverfront’s potential, through a partnership between all levels of government and private investors of nearly $2 billion for the development of the city. It may take up to 15 years to complete this phase. Phase IV An ecological restoration would be made in Phase IV, taking up to 20 years to recover natural areas that will remain untouched by tourists and visitors from the city. A New Riverfront Park & Cayce Landing The project had many obstacles: poor water quality, environmental issues, and a lack of wildlife corridors and urban lungs such as greenways or parks. 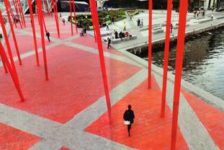 A highly experienced group of specialists took action and accepted the challenge of reactivating this key node of the city. 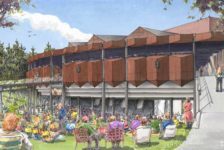 Hargreaves Associates, along with Hawkins Partners and Everton Oglesby Architects, were now in charge of the implementation of the project’s first five-year phase. Before the transformation, the riverfront site consisted of a 17-acre parking lot, without a single tree and sullied by pollution. This massive asphalt slab was used as esplanade during festivals and concerts. This space was divided into two 7.5-acre parcels for the redevelopment. Home of the Tennessee Titans NFL franchise The LP Field, extends its parking space into this area, so a generous space will remain for the same activity — but with a greener approach. What’s left over from the park will be turned into an “urban forest”, with grass and porous pavers along the tree swale. We Are the World, We Are the Children Mayor Karl Dean wasn’t just impressed with the final result; he said he wished he were young again so that he could play in the glades, hollows, and ridgelines that have become spray grounds and picnic lawns. 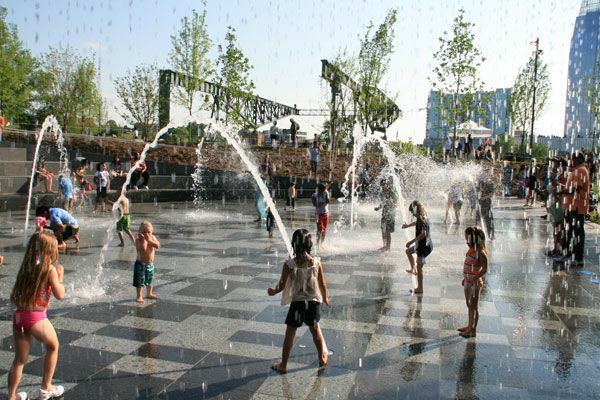 The Greatest Weekend Experience The whole place is made to provide the greatest weekend experience and the Riverfront Adventure Park is made for children in every way; it is an exciting design that provides all kind of activities in a safe environment. 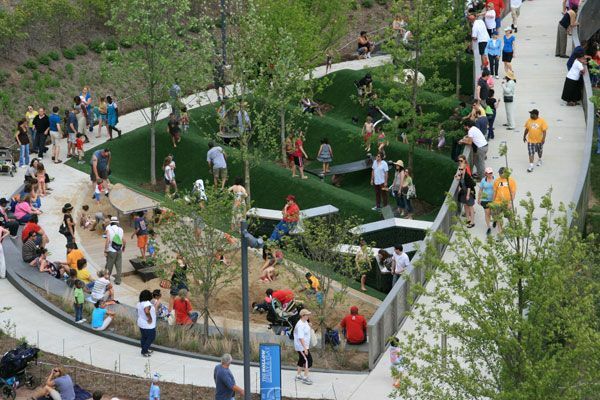 Besides the design and fun features, the park has a series of sustainable considerations. Approximately 80 percent of the vegetation is native species from Tennessee. Stormwater Harvesting System All the water features are part of a stormwater harvesting system, collecting from the parking area and the bridges. 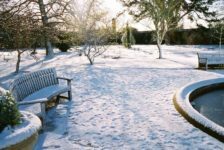 It also feeds the wetland gardens, and the irrigation system takes it from here and it is used for the green areas and lawns before it returns to the river. Smashing Social Boundaries Unlike other recreational playgrounds, the zones of play are not limited to a specific spot, neither are the age limits. Thanks to its clean views and open spaces, the park doesn’t feel too long to walk by. This feature also makes child supervision easier, making the park a safe place to play. 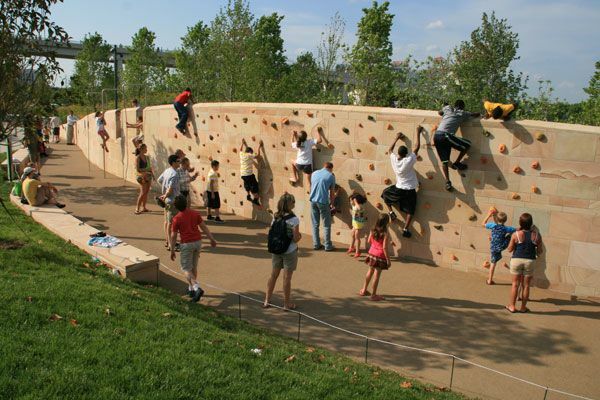 In addition to the “ageless” areas (such as the pavilion, the picnic lawn, the amphitheater ridge, the fishing piers, the river overlook, and the plaza), the play zones consist of the Gorge, an extensive climbing wall for children with a continuous, irregular, organic-shaped metal net; the courts, for basketball games; the spray ground, fog emitters, and waterfalls as the water amenities for a hot summer; and trails and lawns for kids to do what they enjoy the most — RUN! 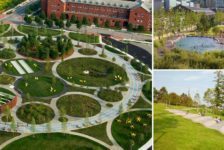 There are also skate parks, slides, hammocks, docks, and a sensory garden, among many other spaces that you wouldn’t believe could all fit in a not-so-big site. Transitioning into the Night During the night, the place is still alive and in perfect communion with its surroundings. The sound of water and the soft illumination, along with the stars, make the river walk a very pleasant place to gather. Occasional movie projections and events take place in the amphitheater, as well. It is great that projects like these are being made. We hope every project takes into consideration the three main strengths that make the Nashville Adventure Park a one-of-a-kind intervention: • Fun! Parks are places to relax and enjoy what you can’t do on weekdays, not just to exercise and sit on benches. Kids will take advantage and show us how to do it. • Aesthetics. This is an obvious one, but not always achieved. 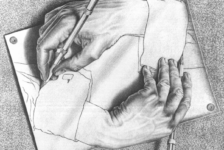 Good design and quality work should be a must in all the things we do. • Green solutions. 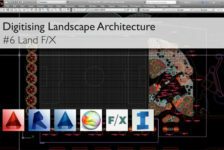 Fortunately, landscape architects are becoming more conscious of environmental issues, and this is now part of the program. 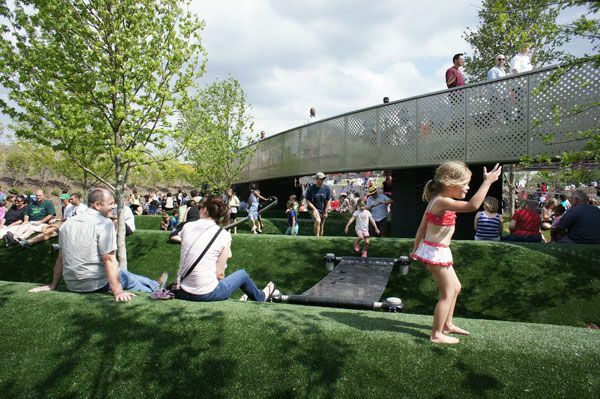 Achieving fun, esthetics and green solutions in one design is a tall order, do you believe this park successfully did it?